Extrema Ratio has increase their medium folder line with the addition of the MF0 T (tanto point). Originally the popular MF0 was only offered with a drop point. 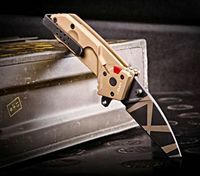 Extrema Ratio has added the tanto point in response to customers' requests. This is a quality folder that makes an excellent EDC. Like the other medium folders, this is a balance between Extrema Ratio's basic folders and their heavy-duty folders. The short blade makes the MF0 T a good option in areas with restricted knife blade length. Solid and compact. The MF0 T blade has been shortened to meet many local law requirements. This compact, clean blade is formed to include a lower guard to protect your hand and has a lanyard hole. It has ambidextrous thumb stubs. If you prefer a shorter, easy-to-carry blade, this is an excellent choice. The handle on the MF0 T has been reduced as much as possible to a minimum length. Even though the handle is somewhat shorter than the other MFs, it has been designed to give you a good grip. A window breaker on the end extends beyond the bridge clip. There is a supplementary screw you can adjust for fine-tuning the knife action. This folder has a liner lock. The MF0 offers you a solid, worry free, locking system that is standard on all the MF knives. The MF0 also have a manual lock which should be used to provide you with an additional level of safety. The MF0 T has a reversible side-to-side clip. This clip is a "bridge" clip that wraps around the end so the knife sits deeper in your pocket for a more discreet carry. It gives you a tip up carry. ** The handle is made of anodized Anticorodal, an aluminum alloy that is very strong and corrosion resistant.